High-tech products manufactured in Europe continue to determine the way ahead for international laminate markets. Environmentally sustainable and manufactured using advanced technology, European laminate products demonstrate outstanding design quality and best possible performance characteristics. As a pioneer in modern flooring design, the European laminate flooring industry will once again be showcasing at Domotex in 2018. 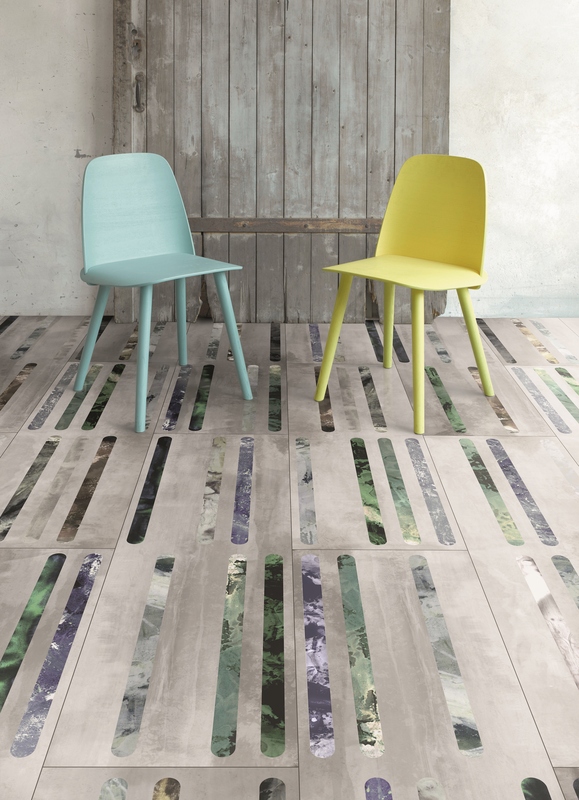 The continuing shift towards individualisation and customisation is placing new demands on flooring design. 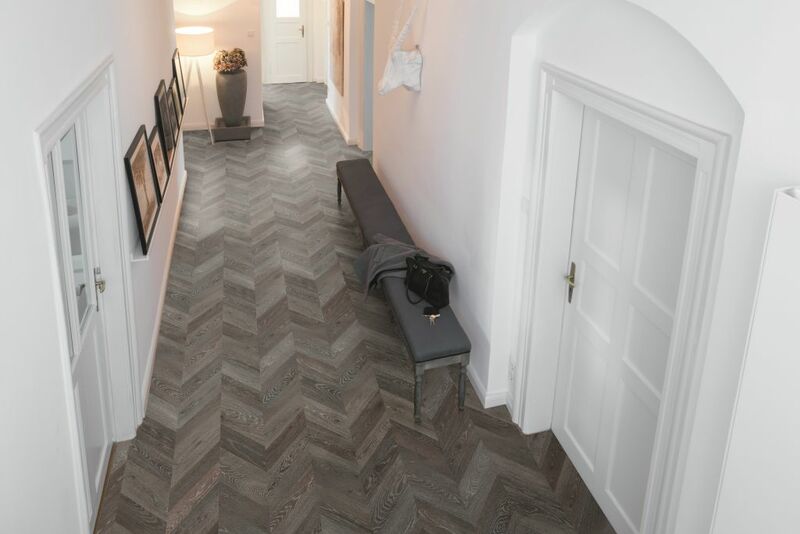 Customers are becoming more discerning about the type of flooring they purchase: it has to coordinate and harmonise with a variety of furniture and interior design styles, look as natural as possible and at the same time be extremely durable and easy to maintain. The latest trends in interior design are proving to be just as diverse as different lifestyles. Currently there are several overlapping, blended styles identifiable within international furnishing and interior design trends. Industrial Chic, for example, combines the look of old industrial spaces with urban style elements, whereas Modern Classic focuses on quality and timelessness of interior design – in the spirit of design classics from the 1950s. Bohemian is altogether different, as it embraces a colourful mixture of style elements from a variety of cultures. The Country theme continues to be popular, with its emphasis on natural elements and regional origin, likewise the Scandinavian style with its sober, clean shapes and light colours. But in this era of digitalisation, there is a major trend emerging that fits perfectly with the underlying concept of the flooring industry: many people are seeking flooring that they can “touch and feel”, and this has resulted in users having a greater awareness of materials. The desire for an authentic look is becoming a determining factor in their choice of products, especially in the furnishings sector. As an overall theme, “authenticity” has strongly influenced the way new laminate floors have been developed. 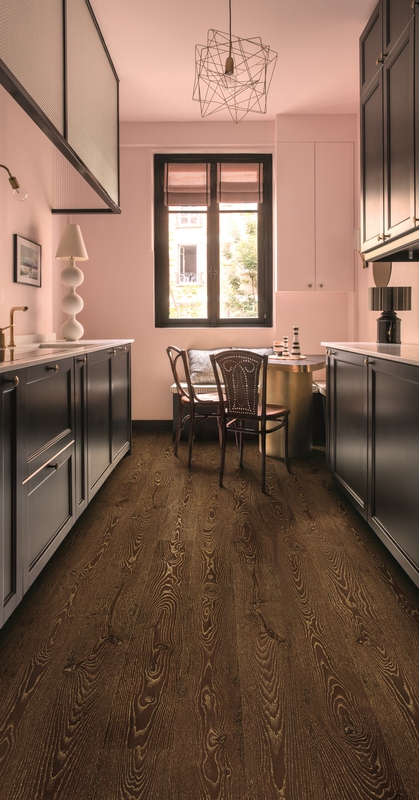 Looking ahead to 2018, a new year for laminate, European laminate manufacturers are well prepared to meet the varied demands of their international clientele. For their current collections they have developed products with many different features for use in any living or working space. The fact that these laminate flooring products are certified as environmentally-friendly and low-emission, and also satisfy strict environmental requirements, is an added bonus for customers. The vintage look and the used look are still major themes underfoot, but overall the appearance of laminate wood decors is now more linear and softer, and textures are used rather less than in the past. Some laminate floor coverings feature slight traces of use on the surface. The sometimes extreme “rustic” look, popular in recent years, has given way to a new kind of naturalness. Special surface treatments on planks, such as “oiled” and “brushed”, are beautifully reflected in a tactile and visual finish. No other wood has as many faces as oak, which is why expressive oak decors remain a long-term trend in the laminate sector. The most dominant colours here range from light to medium dark, with various shades and hues of grey. Equally attractive are the new interpretations of wood reproduction mimicking maple, acacia, beech, alder, ash, spruce, larch and nutwood. Depending on the character of the flooring, the colour palette extends from bright matt white through to deep, warm shades of honey, nutmeg and cognac. Popular in Scandinavia, pine (which is in fact a softwood) can be used as a realistic-looking laminate decor even in heavily trafficked areas. Alongside the wood reproductions which continue to dominate the market, modern stone decors replicating marble, sandstone and slate are increasingly finding favour. With their harmonious blend of colour, texture and shape, these floors have an elegant look and feel inspired by nature. Concrete effect designs, now available in new variations, are also fashionable and are proving to be successful on the market. A special surface effect can be created on laminate boards by incorporating nuanced metallic reflections in gold or bronze. For example, a subtle gold shimmer in a warm, dark wood reproduction can provide a hint of luxury underfoot. 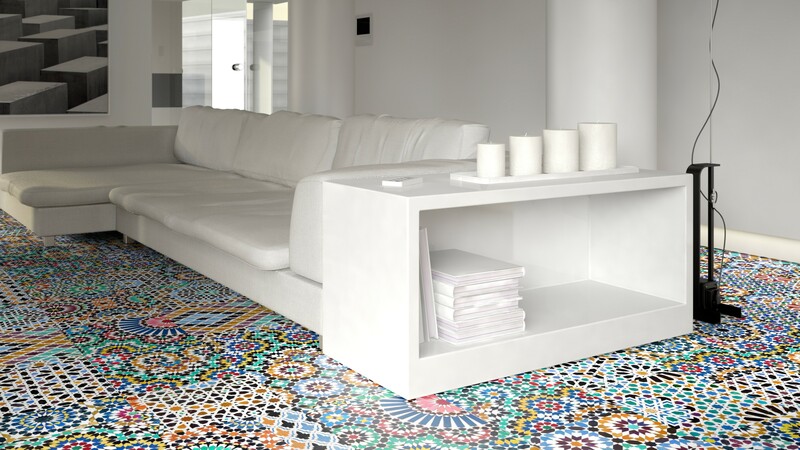 Laminate decors imitating Mediterranean-style mosaic designs bring colour and flamboyance, and their graphic patterns make them truly eye-catching. 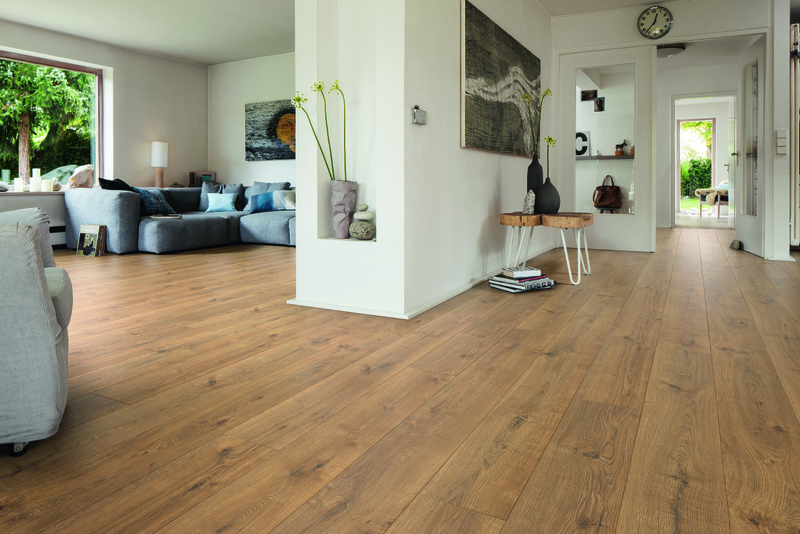 As a contrast to matt effects, new supergloss laminate flooring products are now available on the market. 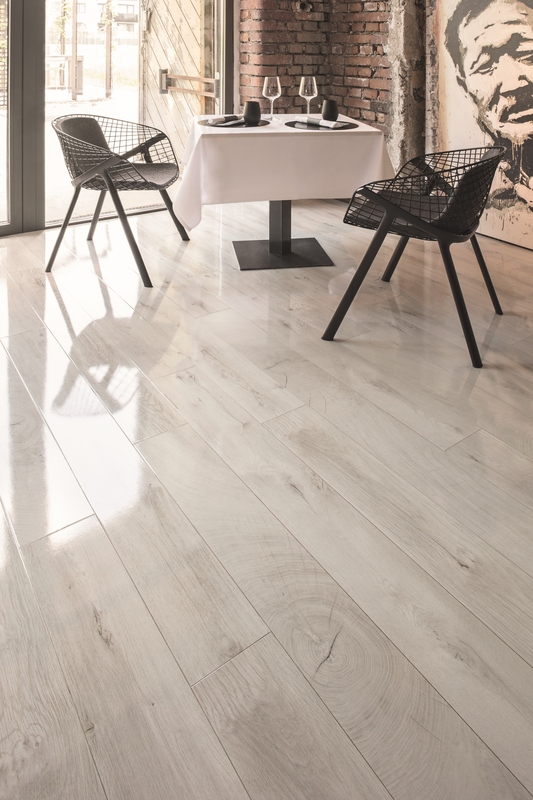 The choice of laminate elements is now even greater, including a wider selection of sizes for tiles, plus single-strip planks and many variations of contemporary multi-strip styles (available in random plank widths if preferred). The classic herringbone pattern is also enjoying a renaissance right now. Staying indisputably in number one position are traditional country-style rustic planks, generously-proportioned both in length and width. This is where realistic-looking wood decors, with their perfectly-reproduced textures and natural play of colours, are shown to best advantage. European producers are constantly among the frontrunners when it comes to using innovative technologies. Industrial digital printing facilitates the design of laminate collections with altogether more variety and colour. This is a real bonus for customers in terms of creative scope and customisation. With no limit to the number of pattern repeats possible, completely new design concepts can be applied, e.g. decors with a visual material mix of wood and stone or ceramic, as well as graphic elements. It is also possible to produce decors and conceptual designs that would come up against technical limitations in the gravure printing process. 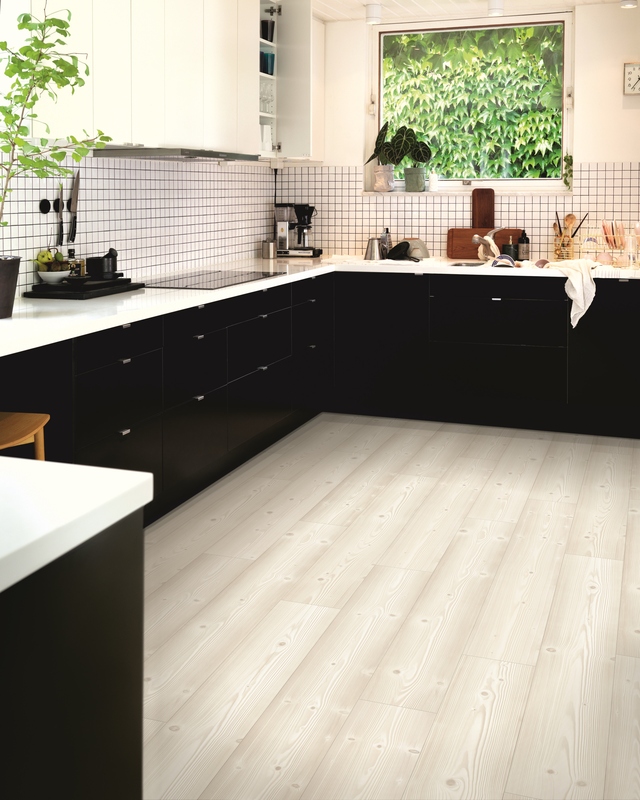 More and more customers want to bring contemporary, easy-to-maintain wood effect laminate flooring into their kitchen and bathroom spaces, too. In keeping with this demand, the proportion of laminate boards with special water-resistant features is growing. The necessary swelling protection is achieved by using newly-developed HDF core boards with a high degree of hardness and density, and also by impregnating the overlay and edges to make the boards much more splash- and moisture-resistant. 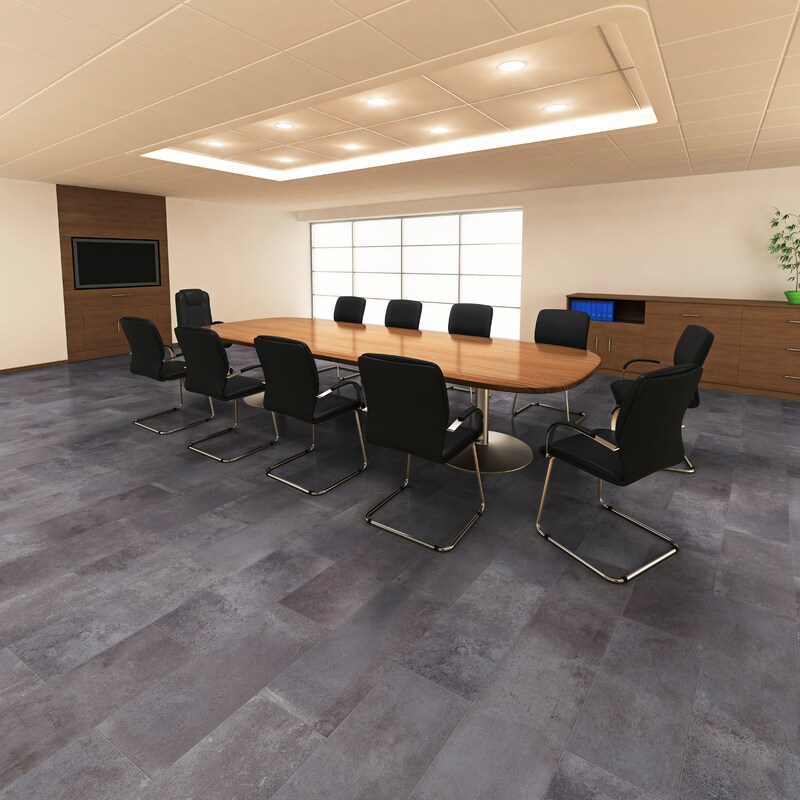 This is what makes laminate such an easy-to-maintain, cost-effective and visually attractive flooring option for the commercial sector. 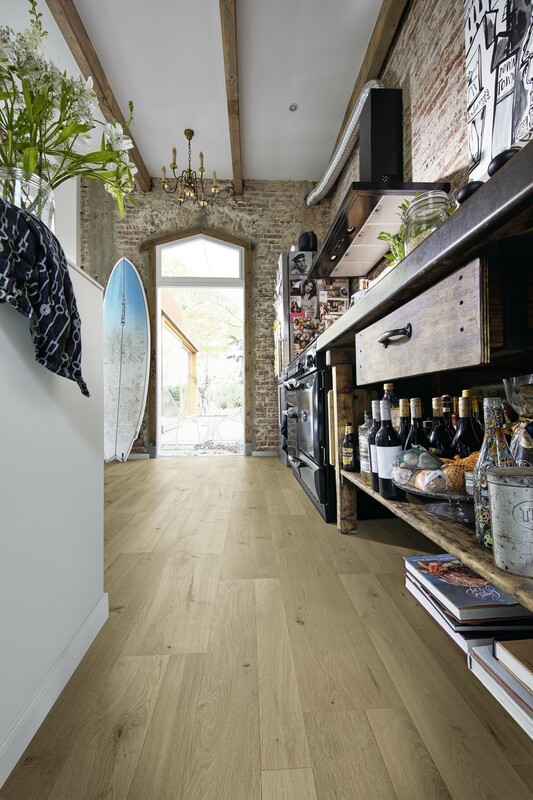 Some of the collections currently on the market offer elements with continuously-coated bevelled edges to create a softer visual transition between boards – another detail adding to the improved moisture resistance of laminate flooring. Combined with the appropriate plank edge treatment, the ingress of moisture is thereby largely prevented. Manufacturers have introduced new solutions for click systems to make installation even easier, quicker and more secure. Some of the designs allow for different connection methods: the elements can either be laid row by row, or by following the staggering principle which allows several installers to work on the same area simultaneously. Angling in on the long sides is an option, as is knocking into place horizontally – very practical in tricky room areas e.g. close to doors or under radiators. The boards are then locked firmly into place afterwards, making the flooring particularly stable to walk on. Dismantling is also a smooth operation – if required, the planks can be taken up again individually. And when it comes to stairs, there are now suitable “assembly kit” solutions available for laminate, allowing the chosen design of flooring to run continuously over multiple storeys. 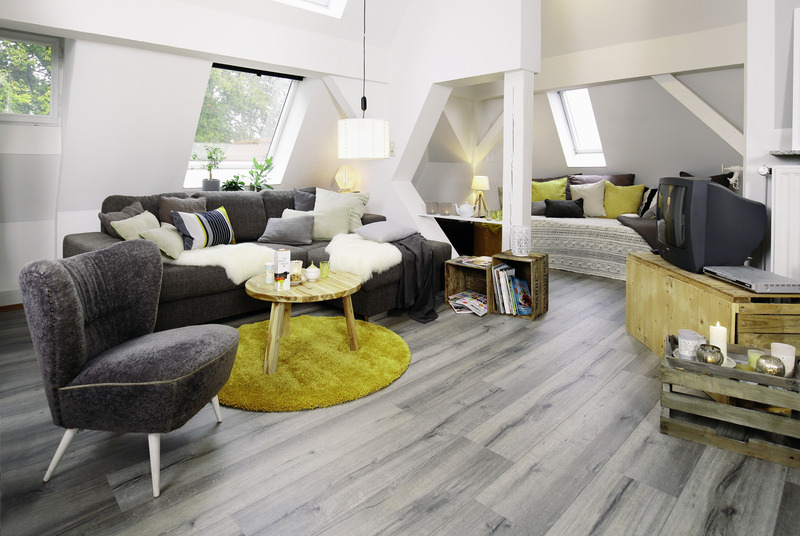 An increasing number of new and improved quality laminate products are appearing in the European laminate flooring industry as a result of the input of fresh design ideas and the intelligent use of innovative technologies. During the new laminate season of 2018, EPLF manufacturers will continue to impress and maintain their leading position with confidence.